Just the prior approved constellation was staggering...and now a new VLEO plus frequency additions/re-alignment...puts this on a level that no one will be able to compare to when the systems are completed. The consumer terminal will be the "interesting aspect"...but I believe that they can pull this off..in stages. I would think the trick will be to have variants of the consumer terminal..starting at basic and upping the ante as the constellations mature and new features introduced to consumers.The consumers will not just be for the "net". A whole range of different consumers will eventually be in the mix, which will also be in competition with the regulars such as iridium and SES. The new customers of the "future" may lead to..aircraft internet and data/position tracking, marine communications and tracking, land traffic, military communications, continental "feed" transmission for broadband and generic consumer consumption for all broadband uses. This will start out small but be a "monster constellation" in a decade. What I think they'll do .. and this is just my thinking ... they'll launch the first batches with the already-approved frequency ranges (as they can build those first), then intersperse the constellation(s) with the later batches with the upgrades to the electronics that can accommodate the other frequencies as-approved down the line. Nothing saying the later batches can't travel into their respective positions either. Difficult and tricky, yes; not desirable either, but do-able. With the number of birds being discussed and the bandwidth requirements (and likely consumer demand) they'll need to co-locate multiple birds to service each node and learn how to safely (read: at minimal risk) add to the nodes as needed. As I said, this is just my thinking. There is a way around this. SpaceX already has the 4425 constellation approved. They have applied and received a limited band allotment to add to it. They also waived another higher band for now. The problem is that the FCC is unsure how to designate that waived band. Boeing just put a request for a similar band as well but will go nowhere for now. The waived bands in question will be eventually released and the use will be determined as intended. If I were running it, I would proceed as intended with the 4425 constellation. The birds for it should already be equipped with the 2 new bands. Now if one were to also put the equipment for the "waived bands, but leave it turned off and software configurable, when the time comes for allotment...just turn it on. The wived bands are so close to the upper 2 V bands that they could be incorporated but software limited in use for now. The 7518 will be a new constellation and can be designed with everything from the start, including the software configurable bands...Ground use can follow the same strategy. The cost is not going to be much higher, they are already in the bands range. Summary..constellation #1 has same as before with new allocation, but software restricted for present licence. The second constellation as designed with same software restriction until bands released. If the next year and half required for design finalization/production, it gives them 4 years to put up approx 525 for #1 and approx 900 for #2 each year for 4 years and use BFR/BFS for the final 3 years to put the other 50% of both constellations up. Just depends on sat size and max number in a F9B5 fairing. A piece on SpaceX and StarLink popped up on Reuters today! Apparently those fired came from environments like Microsoft and Google which have a slower development culture. SpaceX has filed plans with the US Federal Communications Committee (FCC) to build a constellation known as Starlink, consisting of 4,425 low Earth orbit communication satellites. It will use phased array antennas for up and downlinks and laser communication between satellites to provide low-latency high bandwidth coverage over most of the world. To understand the latency propertes of such a network, we built a simulator based on public details from the FCC filings. We evaluate possible ways to use the laser links to provide a network, and look at the problem of routing on this network. We provide a preliminary evaluation of how well such a network can provide low-latency communications, and examine its multipath properties. We conclude that a network built in this manner can provide lower latency communications than any possible terrestrial optical fiber network for communications over distances greater than about 3000 km. We already knew this a year ago. Better than predicted functionality, impossible throughput realized, SpaceX will be printing their own money from the results. Maybe they should be asking us. Heh. It does please me! Premature failures at the higher altitude would have stayed up there a 1000+ years being debris creators. 550km would be very responsible. The sub links are at the above link...such as technical...pdf downloads available. The one thing about this besides it being very cool is I hope they have a way to de-orbit those sats when they end of life. That would be a lot of useless hardware up there. At similar altitudes there is still enough atmosphere to cause drag. This is why the ISS needs regular re-boosting to a higher altitude by visiting spacecraft. As such, a damaged or dead LEO StarLink satellite at 550km will passively de-orbit in 1-3 years, 5 tops. No action needed. That's per the FCC filings. A normally retired StarLink LEO satellite (4,400+ in number) will use its plasma engine to deorbit even faster. The even lower VLEO StarLink satellites (7,518 of them) will need even more frequent plasma engine use to prevent even faster passive de-orbiting. A self-disposing orbit. No longer necessary. The orbital decay ensures that each satellite is gone within 5 years. Haha, @DocM beat me to the punch by seconds. This is friggin' cool, though. Latency dropping to ~15ms at the altitude the constellation will operate at. An already fantastic selling point becomes more optimal. Financial and Business sectors will be extremely pleased with this development like Mr. Desch is. I thought that it may be of help to clear up a few items that a few news outlets are having difficulty with. Over the next little while, if feeling okay, I will explain general goodies from what I have data mined so far. First is latency....it is important...for some applications.... irrelevant for others. An example of importance would be live chat or stock market transactions where sooner is better and/or less noticeable. Where it is not so important is in buffered applications such as general file transfer and watching a netflix movie. Latency will depend on altitude of the satellite in question as well as other considerations of your "satellite link budget". The budget is what we use to calculate power losses due to variables that affect the frequency in use, the tighter the budget, the more likely of interruption. An example is satellite TV during a rain storm...those great looking colored squares, because the budget only allots a general loss for certain atmospherics, this is required to enable the system to be affordable for the consumer. The above video is for one altitude and does not contain the latest data from FCC filing in respect to both constellations. The video is good enough to portray activities in general. 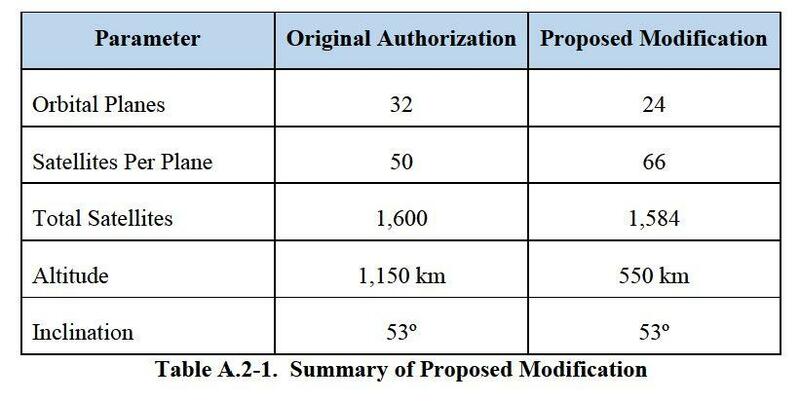 To get up to speed, SpaceX filed and received a permit for a 4425 constellation, Ka and Ku band in 6 planes. As of November 6th, 2018, a request for modification has been entered as well as an application for another constellation. This modification will remove the 1600 satellites in the 1150 km orbit and put 1584 satellites at 550 km instead which makes the 4425 sat constellation now at 4409 satellites. The modification proposal also asks to include V band communications in the 4409 constellation...this is important for the future. The next constellation will be 7518 satellites, in V band only...we can talk about that.....much later. This adds up to 4409 as per FCC filing. This will also hopefully be authorized with V band...so it plays well with the next constellation. Apogee and perigee will be maintained to within 30 km and inclinations to 0.5 degree. Within the 1584 satellites, the first deployment will start with 1st generation satellites with a simpler design to start the constellation sooner and then iterations will commence quickly, starting in 2019. Sound familiar. The first batch will use Ku then will have Ku and Ka introduced. Ground stations will start with dish and move to an array. teaser...final plan implementation of both constellations is V band to consumer terminal....you read that right, will cover later. Right now, it's get it up fast, iterate as they go and move quick...average sat life is 5 years which will get the older ones out fast for the "new toys". They will need BFR within a few years. Steerable pattern controlled by constellation ground station. I won't bother with power densities until a later time. (SpaceX filed and received a permit for a 4425 constellation, Ka and Ku band in 6 planes) should have been 5 altitude orbits. Having too much fun with 3 monitors full of data and I got ahead of myself with planes. 4409 satellites in 5 altitudes which contain 75 planes total and the lower V band frequencies have been approved for the 4409 constellation...SpaceX removed a few extra higher V band frequencies via waiver but I am pretty sure it's temporary because the bands are not even allotted at this time. SpaceX will be the ones pushing and defining the overall use of these upper bands. I will have to save the debris mitigation topic for the next post. I felt that the following was important enough to post first. I apologize for the wall of text but hopefully someone will read a sentence or two. 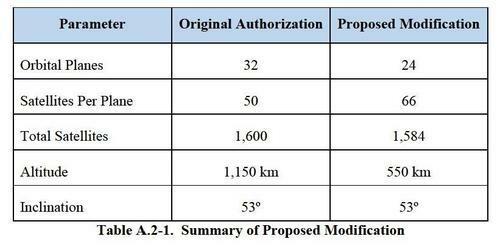 For its proposed operations at 550 km, SpaceX expects the insertion altitude for the modified 1,584 satellites generally to be 300-350 km and raise by thrusters. I would hazard to guess that initial launches on F9B5 will be from LC39A and LC40 with instantaneous windows. Since this is LEO, I have a hunch that the "fairing" will be a "volume restriction" for the number of satellites on a dispenser. Not a lot of information out in the wild but estimates that I have seen lean around 25 to 40 satellites...we will see later when more data available. A reddit user dug up a Space Act Agreement between NASA and SpaceX which in itself is not unusual...until one notices JPL/Caltech's RTGx software and reference to Linux use on a Xilinx Ultrascale+ quad A53's with dual frequency GPS receiver, signed 17th of August 2018 with a completion date of 3 months from signing, which is approximately next week. This is a contract for evaluation, recommendation and modifications for optimal use of the RTGx system, fastest real time GPS system with WAAS, presently available. WAAS is a Wide Area Augmentation System, LAAS is local. These systems add correction factors to drastically improve accuracy. Quick examples for GPS...average system much like cell phones, around a meter. Survey/Scientific systems are in the cm range and military systems are kept quiet but it is real time and very accurate. This is why a quality survey/science receiver with augmentation can cost upwards of $50,000...your cellphone must keep costs down. I was going to cover this in detail for the GPS3 launch coming up but will throw a bit here. Ephemeris (Almanac) data is formatted and stored in all stations, sats and terminals. It contains all data for the satellites geospatial particulars such as position, altitude, velocity, unique identifiers, corrections, sat health and future movement. This is updated...the rate of which depends on end user capabilities. This is very important, in this case use, for user terminal beam geometry, inter-satellite communications and for routing algorithms. The altitude that the first batch will be working in is 550 km. This altitude still has very minor atmospheric constituents but for RF communications, we can call it a vacuum for short distance use. One things that gets lost in news articles is the context of velocity and bandwidth. There are several methods of modulation and depth of modulation to a carrier. This example will be a very simplistic approach to get the concept. If I have a carrier frequency and use 10% of it for data, this is an easy multiple to do in your head. 1 Mhz carrier allows 100 Khz BW, 100 Mhz carrier allows 10 Mhz BW and a 10 Ghz carrier allows 1 Ghz BW. Next is velocity. In a pure vacuum medium, RF communication is at the speed of light. It does not matter what the frequency is, they are all the same velocity. Laser communications is just at a higher frequency in the radio magnetic spectrum. One can now see that the higher in the spectrum that we operate, the same level of modulation results in a larger BW to contain data. The issue is when we are not operating in a pure vacuum. Materials/environments represent a plethora of characteristics which slow signal propagation or outright absorb/reflect it. There are trade offs with every frequency band we use and the transmission medium we employ. A vacuum, fiber optic, waveguide, planar strip, plasma, dielectric or plain metal conductor all represent trade offs for a particular frequency range. An example is quality fiber will have a transmission velocity at half of "c". A piece of copper wire can act like an inductance or capacitance at various frequencies. A mixture of topology can cause a phase error which must be corrected on the system. An example is "intelligence" being ready for the next process in a mixed circuit but must be buffered/delayed until another piece of "intelligence" in a different substraight arrives. Summary...vacuum transmission is fast. Satellite components, terrestrial components, atmospherics and processes/algorithms are the issue. This is why I believe software processes and routing for this complex system will take many iterations. Google's involvement, possibly a bit of "ai", will be instrumental for fast iteration. This is just my opinion, you folks may have a different take but...history repeats itself. A few of us have followed the progression of technology. There has been excitement, achievements and the usual detractors. First it can't be done. Then when getting close, focus of complaints narrow. When accomplished, focus shifts to false economies for other attributes while some get their butts kicked. There are still many critics, some tied to other loyalties, political arena of mega military contractors and location of "pork industries", lack of STEM knowledge, lack of interest or just plain hatred of Elon Musk. This is the adventure of renewable energy and responsible transportation. When it gets close...focus shifts to poor comparisons of quality, range and convenience. When it is on its way, attack the company on safety, rebates, short selling, cash flow or as usual, pick on Elon. Tesla has helped lead the change world wide. EV's are here to stay, diesels are beginning to be removed from production, combustion engines are "souring" with the awareness of "climate change". Solar energy and battery walls have proved their worth. Other countries that have been on-board before are increasing the pace to renewables. Europe, China and Southeast Asia have and continue amazing work towards lessening reliance on fossil fuel. The issue is the mega fossil fuel empire. They have pull and will cause frustration till the end. Dealerships tied to political strings, States tied to oil interests and delaying solar deployment (Florida ring a bell). Auto manufacturers now need to retool and reduce combustion production. This will not go away...Tesla is fighting against big oil, auto manufacturers, parts suppliers for combustion, energy giants and of course politicians and lobbyists. Last but not least are the usual pundits...climate change deniers, the STEM iliterate and of course the "I hate Elon at all costs" group. The adventure for universal internet access begins. This system, when complete will have capabilities far beyond broadband internet and may eventually encompass pretty much anything handled by "everyone's" satellite network..let that sink in. Right now we are at the can't be done phase with some quietly showing that it actually could be done. Constellation squabbles have already started, a lot with misleading information from competitors evidenced by the FCC filings. There will be several iterations, satellites will take at least 6 years for the full initial constellation and a few more for the second constellation and full BFR/BFS use. 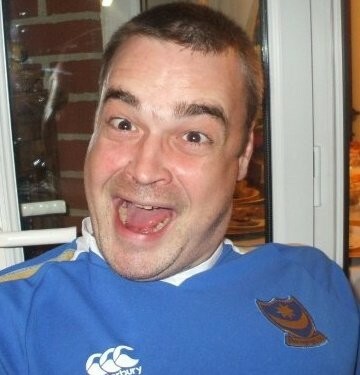 In the mean time...the usual pundits will talk about poor initial results which will eventually tail off. Starlink will have a lot of "enemies" such as broadband companies, local providers, satellite operators that know the capabilities as Starlink progresses. This will involve big business...world wide with the politics, as the system grows. This will not go away...and of course...insert the usual "Elon haters" for another venue of attack. This will get ugly and the technological enthusiasts will have to put up with the "bad press" for quite some time to come. Patience will be valuable during this period and the "bad press" and "pundit" involvement will exceed that of TESLA. On the lighter side....we are going to see a few more companies "edging in"
We will eventually see SES,Orbcom, Intelsat, Iridium,and a lot more plying their niche's like IOT, TV , music, film cloud service access , inventory tracking....bottom line is their profitability. This will increase as the constellation develops. This looks better with the 550 km initial orbital change. I believe that the routing will obviously be determined by software, but in my opinion, he may have made a few assumptions that I would have refrained from. This will be one constellation, multiple use with inter-satellite communications as well as ground support. The level of inter- satellite interaction will be determined as the system evolves, as implied in the various filings. I have a hunch but prefer not to change feet at the moment. There is a lot of critical data missing, which is very intentional and very understandable. Even the size of the initial payloads are a bit ambiguous even when we have an idea of thruster size, fuel tank mass, the mass of the 4 gyro's...etc...but I have collected several images that I will post later. Found this of interest, but I will stop posting these as several companies are ramping up the "customer" acquisition attempt, with what they have at the time. Some subtle, some not so, but it was expected to start some time, might as well be now. Particularly when Elon has stated a quicker introduction and iteration of the constellation system. On 14 November at 13:20, @INTELSAT’s @jpgillet will participate in a discussion at #AfricaCom around how hybrid networks are the key to solving the digital divide and #satellite technology is essential to building out Africa’s network infrastructure and meeting broadband demands! 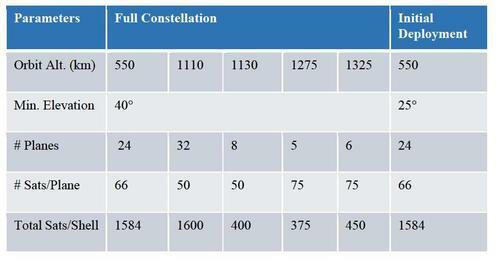 From the table we can see that the 1584 satellites will be in the 550 km orbital altitude. The number of planes is 24. Use the equator as reference and 360 degrees divided by 12 planes (2 planes opposed) means a spacing between plane sets of 30 degrees. A visual idea is one plane set crossing at 30 degrees and the plane set beside it will be crossing at 60 degrees. All plane sets equally spaced by 30 degrees and each plane set will have an inclination of 53 degrees east and 180-53 degrees west. Each plane has 66 satellites. Earth radius is 6371 km, then add 550 km for a total from earth core of 6921 km. Circumference is 2Piradius which gives us 43485.926 km. this circumference divided by 66 satellites will give a distance of approximately 660 miles for and aft in a plane. Note...One may ask why opposed planes...A series of single inclined plane at that altitude and the beam patterns from the FCC filing will result in an approximately 30% loss of geography coverage...I did a rough calculation/simulation. 5727 seconds to orbit, or approx 95.4 minutes orbital period. From data mining an orbital plane at 1110 km and 53.8 degrees inclination,I found an orbital period of 6420 seconds or 107 minutes. ISS at 400 km is approximately 92.7 minute orbital period. ISS varies from 330 km to 435 km presently. Lower limit may need to be modified later. A quick visualization is putting the ISS tracker on your browser and imagine the ISS as a constellation satellite with a satellite for and aft by of this at 660 miles....then visualize the other planes criss crossing and the sets spaced across the equator by 30 degrees. At the equator, each degree of latitude is 111 km, 30 degrees is approximately 3330 kilometers and narrows as longitude moves to the poles. This seems large but with an inclination of 53 degrees, approximately 2/3 of the planet, centered on the equator, will have coverage. The above is for the initial 1584 satellite constellation layer. There are 4 more altitude bands to fill for the full 4409 satellite constellation. We have not mentioned the 7518 yet. Both constellations, when complete will provide a very robust world broadband network. Non fibre networks do not stand a chance against this when implemented. The upper 4 altitude bands are the ones that require proper mitigation since an unattended satellite can be up there for centuries. The 550 km 1584 satellite batch and the full VLEO of 7518 satellites will be easy. SpaceX intends to perform an active disposal of all of its satellites at the end of their life, in which the satellites first drop to a perigee of approximately 300 km while maintaining an apogee at approximately 550 km. For the new lower shell of satellites, this “active” phase of the deorbit sequence will take a few weeks for each vehicle, after which several weeks to months of “passive” disposal follow, with the exact time depending on solar activity. Even this phase is not fully passive – to minimize the risk of debris even further, SpaceX satellites will continue to perform conjunction avoidance until the high atmospheric torques from low altitudes cause the vehicle to be uncontrollable. At all times during this descent, including the period during which they will traverse the orbital altitude of the ISS and other NASA assets, the spacecraft will retain sufficient fuel to perform maneuvers. After all propellant is consumed, the spacecraft will be reoriented to maximize the vehicle’s total cross-sectional area. Finally, the spacecraft will begin to passivate, drawing batteries down to a safe level and powering down. While SpaceX expects its satellites to perform nominally and deorbit actively as described above, in the unlikely event a vehicle is unable to finish its planned disposal maneuver, the denser atmospheric conditions at 550 km provide fully passive redundancy to SpaceX’s active disposal procedures. The natural orbital decay of a satellite at 1,150 km requires hundreds of years to enter the Earth’s atmosphere, but the lower satellites at an altitude of 550 km will take less than five years to do so, even considering worst-case assumptions. Due to the very lightweight design of the new spacecraft, SpaceX achieves a very high area-to-mass ratio on its vehicles. Combined with the natural atmospheric drag environment at 550 km, this high ratio ensures rapid decay even in the absence of the nominally planned disposal sequence. Thus, even assuming an extreme worst-case scenario – i.e., the spacecraft fails while in the operational orbit (circular at 550 km), has no attitude control, and solar activity is at a minimum – the longest decay time is still only approximately 4.5-5 years. In reality, this confluence of worst-case assumptions is unlikely to be realized for a number of reasons, not the least of which is that overall solar activity is ramping up into the next decade, meaning a more realistic worst-case decay time of 1 to 3 years. But even assuming the unlikely 5-year decay period, SpaceX satellites will reach demise well within the prevailing 25-year deorbit standard. In fact, SpaceX will exceed new stricter parameters NASA recently determined for safe operation of large constellations28 by achieving a 100% success rate of post-mission disposal within 5 years even assuming worst-case conditions, directly addressing one concern previously identified by the Commission. Nonetheless, SpaceX’s nominal disposal plan that it anticipates for nearly every spacecraft will result in a lifetime of less than six months after SpaceX initiates disposal, an advantage of operating at the lower altitude proposed in the modification. // forgiving location. Debris in numbers at that altitude can at some point, render the altitude useless. The spacecraft’s small mass and predominantly aluminum construction maximize the likelihood of atmospheric demise on re-entry. To verify this, SpaceX utilized NASA’s Debris Assessment Software (“DAS”).The SpaceX design remains below the necessary demise threshold, even using worst-case satellite configurations. Although SpaceX made efforts to avoid the use of components resistant to disintegration, some scenarios were unavoidable at this time. DAS analysis indicates that three unique components may have a chance of reaching the Earth’s surface with sufficient energy to result in human casualty. 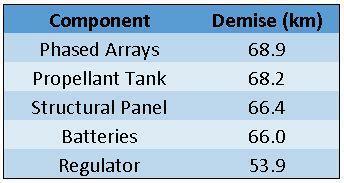 These components are listed in the table below. Comparing these results against those from the Original Applications yields the following observations. First, the total DCA of the communications components has decreased slightly, from 2.79 m2 to 2.34 m2. Second, by far the biggest change is the addition of steel reaction wheels, which were not a potential source of human casualty risk in the prior analysis. SpaceX plans to deploy two versions of its initial satellites with slightly different configurations and each will only carry a subset of the components identified above. FCC approves StarLink's 7,518 satellite VLEO segment, final approval for the full 12,000+ satellite system. The starting pistol...er...shotgun...has been fired. This starts the "pressure cooker" for SpaceX and subsidiaries. 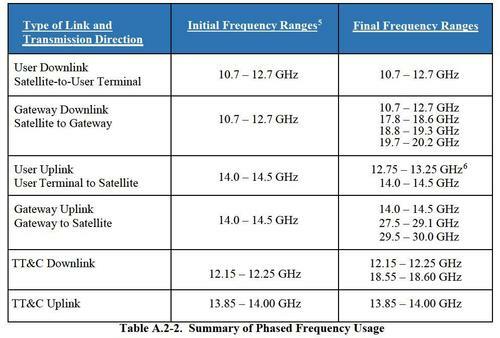 The Starlink lower orbit modification filing has been accepted by the FCC. This should pass...it is the better option for debris mitigation. SpaceX is raising $500 million from investors to help build its worldwide satellite broadband network, The Wall Street Journal reported today. The funding round would pay for initial costs but not the entire project, which the Journal report said could cost as much as $10 billion. 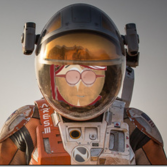 We contacted SpaceX about the funding today but the company declined to comment. SpaceX last month received Federal Communications Commission approval to deploy up to 11,943 broadband satellites for its planned "Starlink" service. SpaceX's initial FCC approval from March of this year requires it to launch 50 percent of the first 4,425 satellites by March 2024 and all of them by March 2027. SpaceX's approval for the second batch of 7,518 satellite similarly requires it to deploy half within six years and the remaining satellites within nine years. However, SpaceX may seek a waiver that would lower the number of satellites it has to deploy in the first six years. The slow progress led Musk to fire some of the project's senior managers. 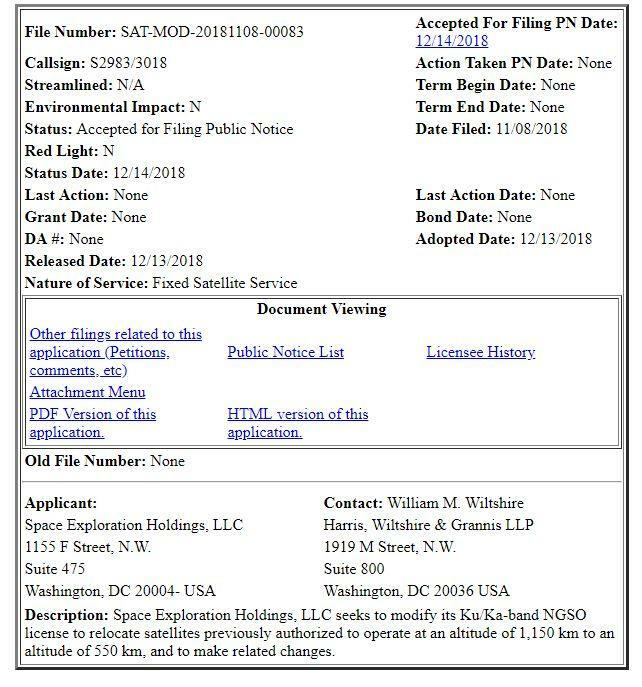 Still, the schedule hasn't changed much since November 2016, when SpaceX's FCC license application mentioned 2019 as a possible time for launching satellites into orbit. A Reuters report in October this year said SpaceX is planning to launch satellites in mid-2019 and offer broadband service in 2020. This is basically keeping venture funding with an internal prior investment firm...this is a good move since they understand the frame work of the project. This funding round and a few more to follow, have one purpose...to place an initial constellation in orbit...as quickly as possible...to generate income which will pay for the rest of the constellation, an estimated $10B venture. The initial launch campaign will be tentatively starting June 2019...This means that F9 and possibly a few FH's later on, will be the work horses for the initial 2 to 3 years. This initial constellation is expected to begin limited operations in 2020 ...this removes any newer vessel from helping F9 with the launch at this time. 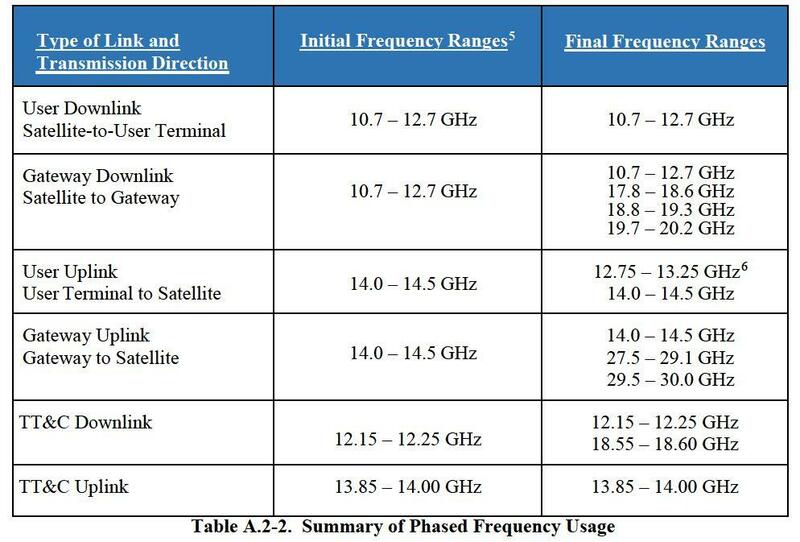 With other competitors on their tail and 2024 not that far away for the FCC mandated constellation numbers....they need to move now. Starship and the super heavy booster will not be ready in time for this initial deployment phase. Getting service started in 2020 means 800 birds launched.